Home » News » Where does Lush palm oil come from? 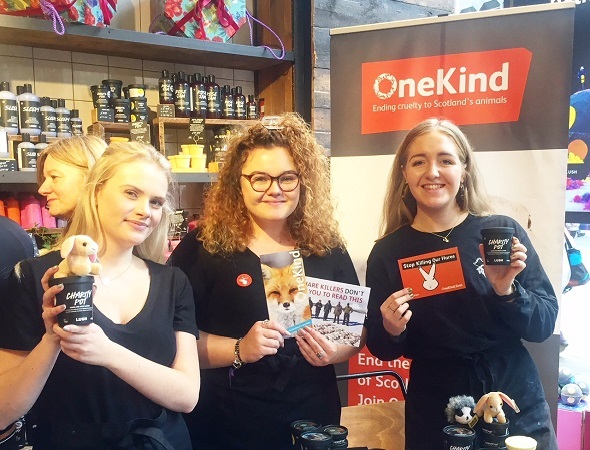 Lush is a fantastic supporter of OneKind’s work. 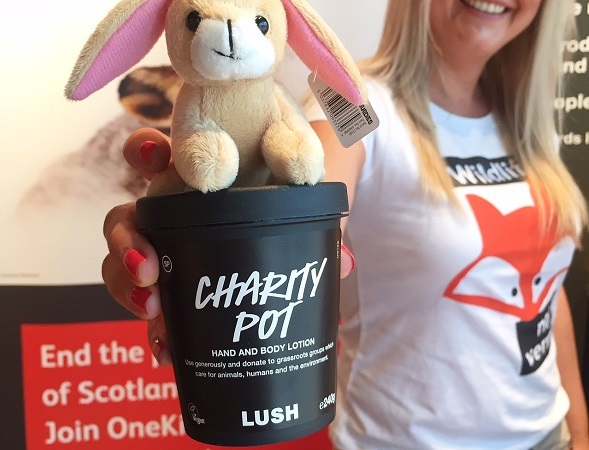 They sell charity pots, tubs of rich ‘n creamy body lotion, the full price of which (minus VAT) is donated to local charities whose ethics align with those endorsed by Lush. Our participation in their charity pot initiative raises crucial money that goes directly towards funding our campaign work. However, some of our social media followers have expressed concern about these events because they are conscious that some products contain Lush palm oil. Even more exciting are Lush’s ‘charity pot weekends’! 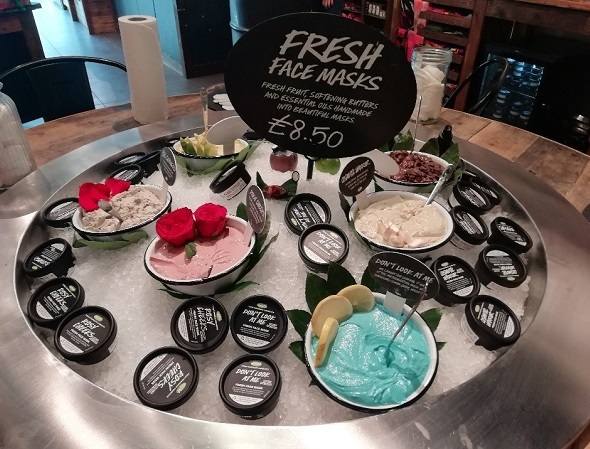 Their wonderful staff invite us along to their Scottish stores, giving us the opportunity to interact directly with Lush customers. At these events we recruit new members and volunteers, collect petition signatures, raise funds for OneKind (through the sale of the pots) and, ultimately, raise awareness for our ongoing campaigns. Lush were instrumental in helping us to expose the massacre of Scotland’s mountain hares earlier this year in the media. What’s the big problem with palm oil? Palm oil is the cheapest and most efficient vegetable oil on the market. Grown predominantly in Southeast Asia, it has generated mass economic growth. However cheap products always exert their costs somewhere. In the case of palm, it is indigenous communities and critically endangered species that are paying. When ancestral land is bought by developers, and large stretches of ancient forest are cleared to grow palm, the local communities are forced to trade their traditional ways of life for dangerous, poorly paid work on the plantations. Human rights are often abused and child labour is endemic. Tropical rainforests and peat soils play a crucial role in stashing away carbon reserves. However, as plantations expand and these vital habitats are destroyed, carbon is released and palm emissions now threatens to surpass that of America’s entire transport industry. Monocultures like palm are totally incompatible with biodiversity, and threaten the survival of 193 species listed as in danger on the IUCN Red List. The Sumatran Rhino and Asian elephant are on the brink of extinction. The Sumatran tiger tallies at 400 individuals; Indonesia’s last tiger’s. The Bornean orangutan’s population has been halved since the turn of the century. So – is Lush complicit in this? We spoke to an Edinburgh store supervisor, Emma, to hear about their palm oil journey. Lush set about removing palm oil from their products in 2008 after conducting research into the industry. They launched a global campaign titled ‘Wash your hands of palm oil’ which is still in motion, a decade later, “The goal is to be 100% palm oil free”, says Emma. While they did succeed in removing the oil itself from every single one of their products (hooray! ), they soon came upon another hurdle. Palm oil derivatives. These creep under the radar of most consumers, disguising themselves in chemical jargon; Stearic Acid, Cetearyl Alcohol, Sodium Stearate etc., etc. Lush discovered that in many cases, removing these derivatives impacted upon the quality of products. So it hasn’t been a quick fix – palm oil is endemic. It wheedles its way into 50% of the items on supermarket shelves. 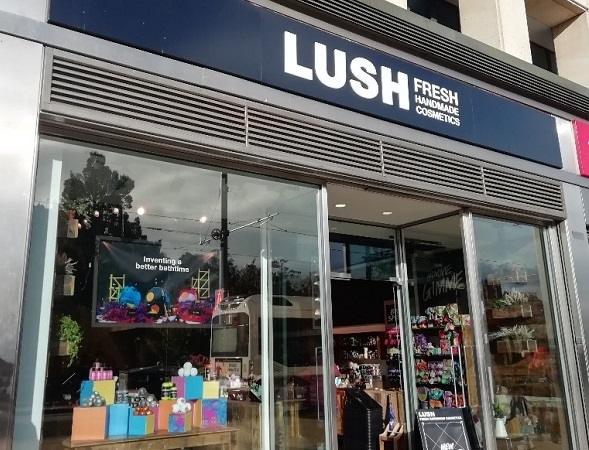 Determined not to give up, and resolute in their ambition to create an entirely ethical product for the high street, Lush sought to come up with alternatives. Again and again, the reformulations just didn’t work with the new ingredients. Furthermore, many of the substitutes to palm derivatives are tested on animals and Lush will absolutely not compromise on this basis. Then – Lush decided to take things wholly into their own hands and derived a soap base themselves, containing no trace of palm oil. 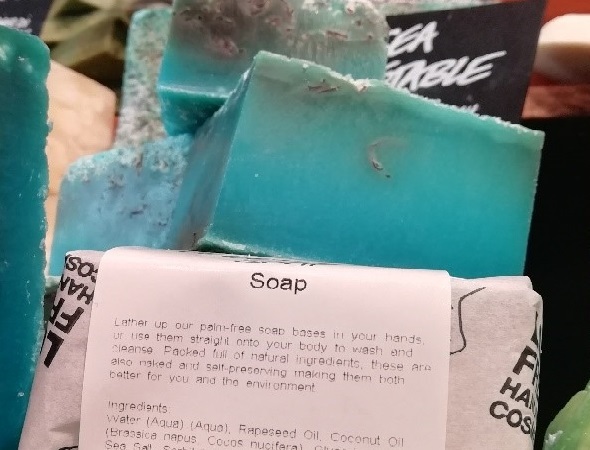 This soap base is used to formulate all of their new soaps and, even better; other businesses are invited to use the recipe to reinvent their products too! Another action as part of Lush’s palm oil campaign was unveiled in 2017. They teamed up with the Sumatran Orangutan Society to launch ‘SOS Sumatra’. Orangutan shaped (totally palm oil free!) soaps were sold globally, the funds of which purchased 50 hectares of old palm plantation on the edge of Leuser national park. Thousands of native rain forest saplings are being planted in the area in an effort to restore this plot of land back to lush green wilderness; an oasis for both critically endangered orangutans and the plethora of other species under threat. Every effort is needed to stem the assault. Lush’s contribution to the battle should be applauded. They are fully transparent when it comes to labelling their products and include a comprehensive list of possible derivatives on their website. If you’d feel happier to completely avoid the stuff, check out their derivative free face masks, perfumes, soaps, cleansers & lots more. 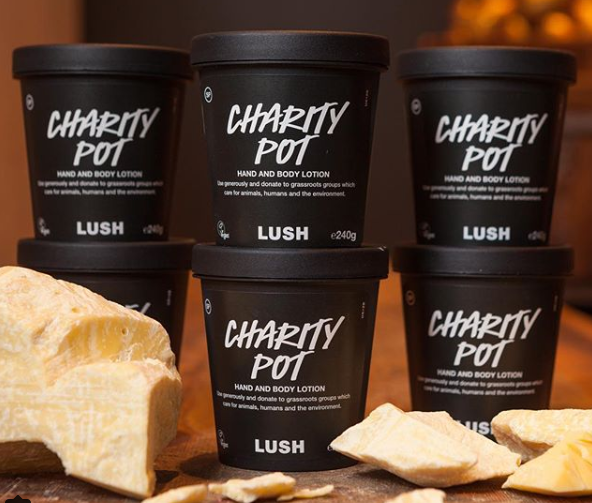 The Lush charity pot initiative has always been focused on supporting long-term projects, those that aim to eradicate the root cause of an issue. The “wash your hands of palm oil” campaign has a similar motivation. Palm oil use in cosmetics is a huge issue, and not one that is easily remedied – the people will want their soap to lather long after the last orangutan has been obliterated! However, Lush are making wonderful progress and are set to fuel a global revolution through their creations. We commend their inspiring work and are pleased as punch to work alongside them. I applaud LUSH which has been leading the way since day 1 from its formulations and campaigns. If someone knows a more proactive beauty company, please tell me about it.